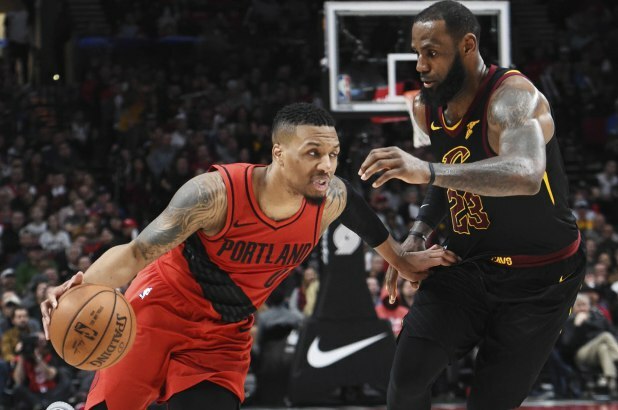 Look, if LeBron James really has to, it seems he would embrace the chance to play with Damian Lillard. The most enticing mega-trade on the board not involving Anthony Davis: Lillard to the Lakers for a package centered around Lonzo Ball. Lillard is a perfect fit next to LeBron, and LeBron respects Lillard’s game, per sources familiar with the matter. The Lakers could absorb Lillard into cap space this summer without sending out giant matching salaries — salaries they don’t have on the books. Before everyone fires up the Trade Machine, let’s be clear: Lillard isn’t on the chopping block. Not currently, at least. That might change if the Blazers’ season goes belly up or he just generally becomes turned off by their treadmill of mediocrity. Even then, though, the Los Angeles Lakers would be hard-pressed to come up with a great offer for him without obliterating the young core. Their best salary-matching pieces are not all that enticing, and putting together a package that sends out two of Kyle Kuzma, Lonzo Ball and Brandon Ingram feels mighty steep. Interesting offers could be built around Kentavious Caldwell-Pope later in the season. Pair his salary with Ball, Hart or Kuzma and a pick, and you’ve really got something. But Lillard has to become available first. And then the Lakers need to be willing to eat into the youthful base they’ve been so adamant on protecting. At least if they do, though, they won’t need to worry about getting LeBron’s stamp of approval.